The Legends of Tomorrow team is comprised of heroes and villains from the present day, but with the help of Time Master Rip Hunter, they’ll be traveling through time to stop main antagonist Vandal Savage at various points in history. So far, it hasn’t been revealed what they’ll encounter during their temporal adventures, but now we’ve learned about one of the first people they’ll be meeting, and it won’t be in the most friendliest of environments. It’s been announced Mr. Robot actress Stephanie Corneliussen will be playing Valentina Vostok, whom comic book fans may know better as Negative Woman, for multiple episodes of the superhero series. Legends of Tomorrow’s Valentina is described as a “gifted and beautiful Soviet physicist” that will do whatever it takes to defend the “Motherland,” according to TV Line. When the eponymous team travels back to the height of the Cold War, they will meet Valentina and suspect she’s in league with Vandal Savage to build a secret weapon. It will be up to The Atom and Captain Cold to win her heart in order to find out where her true loyalties lie and prevent her from completing this weapon, which could turn the tide of the Cold War. 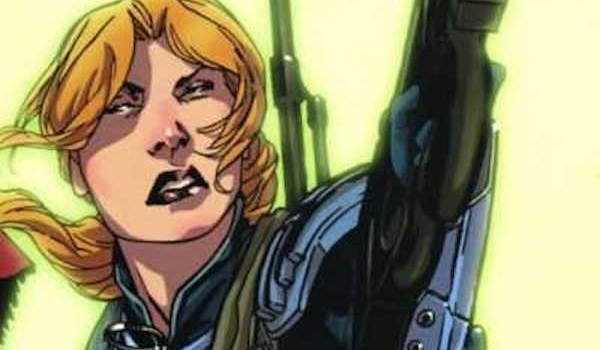 In the comics, Valentina was a Soviet Air Force pilot who attempted to defect to the United States. Unfortunately, the experimental aircraft she stole ended up crashing at the same spot where the original superhero team The Doom Patrol had perished in battle. Valentina was subsequently infused with energy that came from team member Negative Man, only while her male predecessor was able to generate an energy being (called a “soul self”) from out of his own body, she would actually transform herself into that same type of being. Calling herself Negative Woman, she joined a new iteration of the Doom Patrol, but years later when Negative Man was discovered to still be alive, the energy that inhabited her body went back to him and she was left powerless. It doesn’t sound like Valentina will have any unique abilities on Legends of Tomorrow, though maybe an accident involving that mysterious weapon will somehow alter her physical state. If she’s anything like her comic book counterpart, at least fans can take comfort knowing that she won't be hanging out with Vandal Savage for long, though it sounds like Atom and Captain Cold will have their work cut out for them trying to sway her. In addition to her recurring role as Joanna Wellick on Mr. Robot, Corneliussen’s resume also includes guest spots on shows like Bad Judge, Royal Pains and The Exes. Legends of Tomorrow will air sometime in 2016 on The CW, but fans can look forward to the show being set up this December during the crossover between Arrow and The Flash.